Costimuli provide supplementary signals required by naive T cells to become fully activated upon Ag encounter. Tetraspanins are a large family of transmembrane proteins that can costimulate T cells when engaged in vitro. In this study, we describe for the first time that coligation of the tetraspanins CD81, CD82, or CD9 with the costimulatory molecule CD28 in vitro leads to proliferation of naive T cells. When activated through this pathway, both CD4+ and CD8+ naive T cells differentiate into type 2 effector cells, which produce IL-4, IL-5, IL-13, and IL-10, together with IL-2 and TNF-α, but little to no IFN-γ. These effector cells descend from precursors that display early and strong production of IL-4, STAT6 phosphorylation, and up-regulation of the transcription factor GATA-3, suggesting a direct skewing toward Th2 differentiation without a Th0 intermediate. The hepatitis C virus envelope protein E2 is the only ligand known for CD81. Therefore, we propose that this new type of Ag-independent T cell activation may occur in hepatitis C virus-infected individuals, contributing to liver inflammation, impaired type 1 immune responses, and recurrent flares of type 2 immunity associated with chronic infection. It is well established that naive T lymphocytes require at least two distinct signals to undergo full activation and differentiate into effector or memory cells (1). The first signal is induced by triggering of the TCR by MHC:peptide complexes, while the second can be mediated by engagement of surface molecules such as CD28, CD2, LFA-1, and CD49d (2, 3, 4, 5). Recently, a family of membrane proteins known as tetraspanins, which among its members includes CD9, CD37, CD81, CD82, and CD151, have been shown to participate in the process of T cell costimulation (6). One tetraspanin in particular, CD81, is involved in the aggregation of TCR and BCR signaling complexes (7, 8, 9) and appears to play a critical role in the development of type 2 adaptive immune responses (10, 11, 12). Whereas the ligands for most tetraspanins are still unknown, CD81 has been shown to act as one of the receptors for hepatitis C virus (HCV)4 upon recognition by the viral envelope protein E2 (HCV-E2) (13). This pathogen is an enveloped positive strand RNA virus that infects the liver of humans and higher primates, causing a life-long chronic inflammatory disease characterized by severe immunopathology and increased risk of development of hepatocellular carcinoma. Only 30% of individuals spontaneously recover, and it is estimated that ∼3% of the world population is affected (14, 15, 16). Immunologic studies on rare self-healing patients suggest a strong association between HCV elimination and strong and maintained immunity by CD4+ and CD8+ T cells that are capable of robust secretion of IFN-γ upon recognition of a wide array of viral epitopes (17). However, it is yet unclear what could be the factors that favor an efficacious response. In this context, previous works suggest that disease chronicity may depend on an imbalance between type 1 and type 2 immunity, which has been described either as a lack of the former (18, 19, 20, 21) or an excess of the latter, distinguished by peripheral and intrahepatic production of cytokines like IL-4 and IL-13 (22, 23, 24, 25). Several investigators addressed the question whether the interaction between HCV and one of its receptors might underlie a successful strategy of immune evasion. Interestingly, although NK cells are inhibited by the engagement of CD81 on their surface (26, 27), lymphocytes respond to a similar stimulus in a completely different manner. In fact, in vitro studies show that binding of CD81, in ways that mimic the interaction with HCV-E2, can induce Ag-independent proliferation of γδ T cells (28) or naive B cells (29) and act as a costimulus lowering the threshold for TCR-mediated activation of αβ T cells (30, 31). Intriguingly, HCV-infected individuals display symptoms that reflect extensive localized lymphocyte proliferation such as viremia-dependent perihepatic lymphadenopathy (32) and liver infiltration of a large number of activated non HCV-specific T cells (33, 34). In addition, various microenvironmental factors favor activation of circulating lymphocytes in the liver. In particular, ligands for the costimulatory molecule CD28 such as CD80 have been found to be up-regulated on the surface of resident APCs and parenchymal cells during HCV infection and to be related to exacerbated disease conditions (35, 36, 37). In this study, we show a novel TCR-independent activation pathway for human T cells based on co-engagement (TCO cells) of the costimulatory molecule CD28 and a number of tetraspanins including the HCV receptor CD81. These naive CD4+ and CD8+ T cells primed in vitro through ligation of CD28 and CD81 (TCO cells) differentiate into memory or effector cells that are largely unable to produce IFN-γ, but secrete considerable quantities of type 2 and proinflammatory cytokines. In naive CD4+ T cells, this pattern of cytokine production is observed already at the level of priming and is accompanied by early signaling through STAT6 and up-regulation of the Th2 master-control gene GATA-3 (38). Based on the presence of high levels of ligands for CD28 in hepatic lymphoid tissues and in the liver microenvironment, and the concomitant appearance in situ of the only known direct ligand for CD81 during HCV infection, we propose that TCO cells might be generated in vivo and participate in the establishment of chronic hepatitis C.
Abs specific for IFN-γ were purchased from R&D Systems. Abs specific for CD9, CD82, LFA-1, CD49d, CD2, HLA-A, HLA-B, and HLA-C, IL-4, IL-12, IL-13 (clones M-L13, 50F11, HI111, 9F10, RPA-2.10, G46-2.6, MP425D2, C8.6, JES10-5A2, all IgG1 isotype, respectively) were purchased from BD Pharmingen. The anti-CD3 Ab (TR66) was provided by A. Lanzavecchia (Institute for Research in Biomedicine, Bellinzona, Switzerland). The Abs specific for CD81 and HCV-E2 (13, 29), recombinant purified HCV-E2384–715 (39) and recombinant human IL-2 were reagents developed and produced at Novartis Vaccines. The Ab specific for CD28 (clone ANC28.1/5D10) was purchased from Ancell. Nonspecific mouse IgG1 isotype control was purchased from Sigma-Aldrich. Pacific blue, FITC, PE, allophycocyanin, Alexa Fluor 488, Alexa Fluor 700 Abs specific for CD3, CD4, CD8, CD25, CD45RO, CD45RA, L-selectin (CD62L), CD69, CD154, phospho-STAT6, FoxP3, IFN-γ, IL-2, IL-4, IL-5, IL-10, IL-13, TNF-α, and equally labeled isotype-matched controls were purchased from BD Pharmingen. The PE-conjugated Ab specific for human CRTH2 (chemoattractant receptor-homologous molecule expressed on Th2 cells) was purchased from Miltenyi Biotec. Recombinant human IL-4 and IL-12 were purchased from R&D Systems and CFSE was purchased from Molecular Probes. The inhibitors for Src kinases (PP2), p38, ERK, and JNK MAPKs (inhibitor III, inhibitor II, and SP600125, respectively) were all purchased from Calbiochem. PBMC were purified from the blood of healthy adult individuals, after having obtained informed consent, by Ficoll-Hypaque (GE-Healthcare) using gradient centrifugation. Naive T cells were purified by negative selection using the pan-T cell isolation kit (MACS; Miltenyi Biotec) plus anti-CD45RO FITC (BD Pharmingen) Abs and anti-FITC microbeads (Miltenyi Biotec). CD4+ and CD8+ naive T cells were purified by negative selection adding anti-CD4 or anti-CD8 PE Abs (BD Pharmingen) plus anti-PE microbeads (Miltenyi Biotec) to the reaction mix used for total naive T cells. Cell purity was evaluated by flow cytometry and it was found to be >97% for all the subsets purified. All cultures were performed in RPMI 1640 medium (Life Technologies) supplemented with penicillin, streptomycin, and glutamine (Life Technologies), 10% FCS (HyClone Laboratories) and kept at 37°C in a humidified incubator. Naive T cells were cultured in duplicates at 2 × 105 cells/well in 96-well flat-bottom plates (Costar). Anti-CD3 was previously immobilized at 1 μg/ml in PBS on the surface of the plates by incubating overnight at 4°C and, where indicated, was used together with soluble anti-CD28 (clone ANC28.1/5D10, 1 μg/ml). All other Abs, unless otherwise stated, were immobilized at 5 μg/ml. Recombinant purified HCV-E2 was bound to solid phase anti-E2 by incubating culture wells with a solution of protein in PBS for 1 h at 37°C. Coligation of CD28 and CD81 was performed culturing cells on either plate-bound anti-CD81 or HCV-E2 plus soluble anti-CD28 (clone ANC28.1/5D10) at 3 μg/ml, unless otherwise specified. Polyclonal nonpolarized cell lines were generated by stimulation with plate-bound anti-CD3 (coated at 1 μg/ml) plus soluble anti-CD28 (clone ANC28.1/5D10, 1 μg/ml) for 4 days without additional cytokines followed by expansion in medium containing only IL-2. Type 1 and type 2 polyclonal T cell lines were prepared using the same stimulation but in the presence of either IL-12 (5 ng/ml) plus anti-IL-4 and anti-IL-13 (5 μg/ml) or IL-4 (200 U/ml) plus anti-IL-12 and anti-IFN-γ (5 μg/ml) respectively, during the initial 4 days of culture. Duplicate cell cultures were pulsed at either 48 or 72 h with 0.5 μCi/well [3H]thymidine (Amersham Biosciences), incubated for an additional 6 h at 37°C, and harvested onto filter plates (Packard Instruments). Cell counts were analyzed using a TopCount NXT beta counter (Packard Instruments). Naive human T cells were pretreated for 1 h with PP2, SP600125, p38 inhibitor III, and ERK inhibitor II at 37°C. Subsequently, cells were transferred to flat-bottom 96-well culture plates and stimulated in duplicate for 48 h. Then cell proliferation was measured by [3H]thymidine incorporation and the percentage of inhibition of cell division was calculated using the following formula: (1 − (cpm of stimulated sample with inhibitor/cpm of stimulated cells in medium)) × 100. Cell labeling with CFSE was performed as described (40). After 5 days of culture, cells were labeled using allophycocyanin-conjugated Abs, and each assayed subpopulation consisted of 1 × 105 gated cells. Expression of CD45RA, CD45RO, and CD62L was assayed on 1 × 104 gated CD4+ and CD8+ T cells. CD40L/CD154 expression was assessed on highly purified 1 × 104 CD4+ naive T cells at the indicated time points after stimulation. CRTH2 expression was measured on 1 × 104 CD4+ T cells after priming in the indicated conditions and expansion in recombinant IL-2. Cell viability was measured by propidium iodide incorporation. Intracellular detection of cytokines was performed on cells stimulated with 200 nM PMA and 1 μg/ml ionomycin (Sigma-Aldrich) for 2 h. Brefeldin A (10 μg/ml; Sigma-Aldrich) was added for the last 4 h. Allophycocyanin anti-IFN-γ and IL-10, PE anti-IL-4, IL-13, and IL–5, and FITC anti-IFN-γ (BD Pharmingen) were used after fixation with 2% paraformaldehyde and permeabilization with 0.5% saponin (Sigma-Aldrich). Intracellular levels of phospho-STAT6 were measured on 1 × 104 highly purified CD4+ T cells fixed in paraformaldehyde, permeabilized in methanol, and labeled with Alexa Fluor 488 anti-phospho-STAT6 as described (41, 42). Intracellular detection of FoxP3 was performed by first staining cells for surface expression of CD25. Then cells were fixed and permeabilized cells using the FoxP3 buffer set (BD Pharmingen). Finally, cells were stained for FoxP3 expression. Samples were acquired on an LSR-II flow cytometer (BD Biosciences) and data were processed using the software Flowjo (Tree Star). Supernatants were taken from cells cultured in duplicate that were stimulated either for 24 h with anti-CD3 or with other stated combinations of stimuli for the indicated time points. Supernatants were then assayed for the presence of IFN-γ, IL-2, IL-4, IL-5, IL-10, and TNF-α by the electroluminescence multiplex system Sector 2400 Imager from Meso-Scale Discovery. Data were imported and analyzed as for standard ELISA with the Softmax Pro program (Molecular Devices). Total TGF-β was measured in the supernatant of anti-CD3-stimulated naive and in vitro-generated effector cells using the TGF-β1 DuoSet ELISA development system (R&D Systems). To minimize nonspecific background due to the high levels of TGF-β normally present in the FCS, cells were washed twice and cultured in medium supplemented with 5% human serum (Sigma-Aldrich) for restimulation. Total RNA was extracted from purified CD4+ T cells using the RNeasy kit (Qiagen) according to the manufacturer’s instructions. Total RNA was cleaned from DNA using DNase I Amplification Grade and retrotranscribed using Thermo Script RT-PCR System (Invitrogen) with oligo(dT) as primers. PCR was prepared using the iQ SYBR Green Supermix (Bio-Rad) in which ROX reference dye (Stratagene), cDNA template, and the following primer pairs were added: T-bet, 5′-ACTGGAGGTGTCGGGGAAAC-3′, 5′-GCCACAGTAAATGACAGGAATG-3′; GATA-3, 5′-CCCCTTCTTCTCTTTGCTAAAC-3′, 5′-GTCGTTGAATGATTTGCTTTCG-3′; and GAPDH, 5′-CGCCAGCCGAGCCACATC-3′, 5′-CGCCCAATACGACCAAATCCG-3′. Samples were prepared in triplicate, run on a MX3000 ThermoCycler and analyzed using the MX PRO software (Stratagene). GAPDH was used as a control housekeeping gene. Additional controls consisted in samples without cDNA and derived from RNA not treated with reverse transcriptase or with DNase I. Following PCR, the melting curve for each product was determined. Finally, the correct size of the PCR products was controlled by agarose gel electrophoresis. Mean quantity of endogenous GAPDH was determined for each type of stimulus. The relative expression (± SD) of GATA-3 and T-bet relative to GAPDH was calculated by cycle threshold (Ct) for each type of stimulus using CtGAPDH − CtGATA-3 (ΔGATA-3) or CtGAPDH − CtT-bet (ΔT-bet), respectively. Subsequently, the ratio of GATA-3 to T-bet was calculated as ΔGATA-3 − ΔT-bet (ΔΔCt) for each type of stimulation. The ratio in stimulated cells was normalized to the ratio of GATA-3 to T-bet at t = 0. Based on previous observations indicating that during chronic hepatitis C a large portion of activated intrahepatic T lymphocytes are not specific for HCV (17, 33, 34), we hypothesized that this might be the consequence of an unknown form of virus-host interaction. Thus, we decided to test whether co-engagement of the viral receptor CD81 and other non-Ag-specific surface molecules could elicit some form of TCR-independent activation in resting T cells. In our experimental system, we found that highly purified human naive T cells proliferated vigorously when stimulated with an anti-CD81 mAb in combination with anti-CD28 mAbs (Fig. 1⇓A). However, this was not observed with Abs specific for other costimulatory molecules such as CD2, LFA-1, and CD49d, which were administered across a wide concentration range (from 0.1 to 10 μg/ml, data not shown). As tetraspanins are thought to be involved in cis-acting interactions among different members of the same family (6), we tested whether we could induce cell proliferation by engaging CD28 concomitantly with other tetraspanins such as CD82 and CD9 (Fig. 1⇓A). It was found that also co-engagement of CD82 with CD28 triggered robust proliferation of naive T cells, whereas ligation of CD28 with CD9 resulted in moderate cell proliferation. Coligation of CD81 and CD28 induces proliferation of naive T cells. 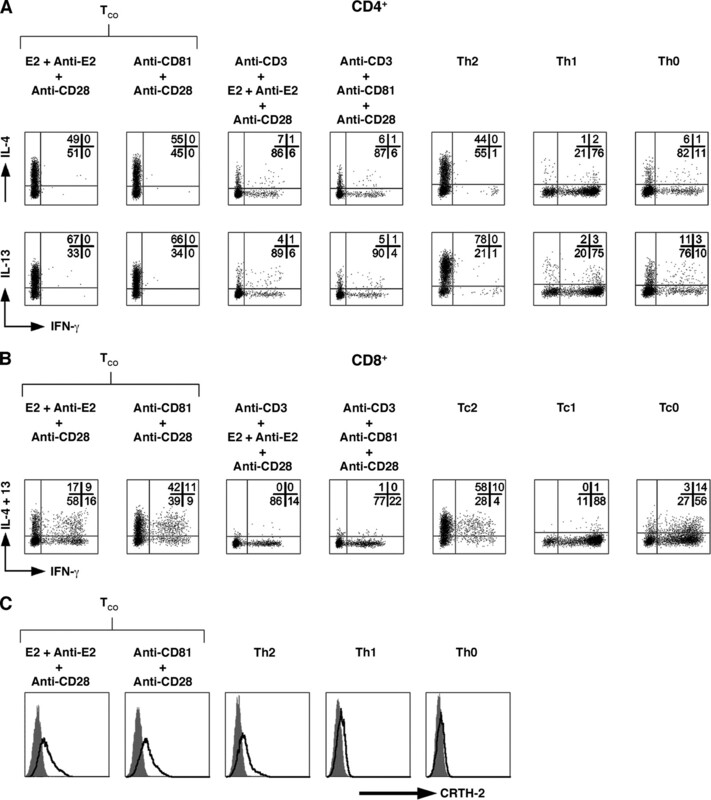 A, Purified human CD45RO− T cells were stimulated with plate-bound anti-CD81 (αCD81, clone 81N), anti-CD82 (αCD82), anti-CD9 (αCD9), or mouse IgG1 isotype control (mIgG1) all coated at 5 μg/ml, or medium in the presence of soluble Abs against CD28 (αCD28, clone ANC28.1/5D10) (▪), isotype-matched control (▦) (all at 1 μg/ml), or medium (□). Data for controls (right) show the response of the same cells to stimulation with plate-bound anti-CD3 or isotype control (αCD3 (clone TR66), mIgG1 (control), both coated at 1 μg/ml) in the presence of soluble anti-CD28 (αCD28 (clone ANC28.1/5D10), at 1 μg/ml) or isotype control at the same concentration. B and C, The same cells were cultured in triplicate for 72 h either with plate-bound anti-CD81 (5 μg/ml) plus soluble anti-CD28 at varying concentrations (B) or in the presence of the optimal concentration of soluble anti-CD28 (3 μg/ml) plus solid phase anti-CD81 at different doses (C). After 72 h, cells were pulsed with [3H]thymidine to measure their proliferation. Data represent the average cpm ± SD from triplicate wells. One of three experiments with similar results is shown. When we further analyzed the contribution of each of the two stimuli, we found that the magnitude of the cell response was directly proportional to the extent of binding of either CD28 (Fig. 1⇑B) or the tetraspanin CD81 (Fig. 1⇑C). However, using anti-CD28 mAbs at concentrations higher than 3 μg/ml consistently caused proliferation to fall below maximal levels. Among the tested tetraspanins that elicited strong proliferation, only CD81 has a clearly identified counter-receptor, and that is the HCV envelope protein E2 (13). Coherently with our previous results, we found that engagement of CD81 by immobilized HCV envelope protein was as efficient as anti-CD81 mAbs in inducing cell division when coupled to soluble anti-CD28 (Fig. 2⇓). Accordingly, only anti-CD81 mAbs that neutralize binding of the HCV envelope protein E2 to CD81 (29) could be used to induce proliferation of naive T cells. In both cases, the amount of cell activation detected was comparable to that of naive T cells treated with standard stimuli such as anti-CD3 plus anti-CD28. Only engagement of CD81 by HCV-E2 or neutralizing Abs synergizes with ligation of CD28. Human naive T cells were cultured with recombinant HCV envelope proteins immobilized on plate-bound anti-E2 plus soluble anti-CD28 (clone ANC28.1/5D10). Additional controls included cells cultured with anti-CD28 plus anti-CD81 either capable of neutralizing binding of HCV-E2 (anti-CD81 (N81), 5 μg/ml) or non-neutralizing anti-CD81 (anti-CD81* (MG81), 5 μg/ml), cells cultured with anti-CD28 plus anti-E2 and recombinant HIV gp120 and cells cultured with plate-bound anti-CD3 plus soluble anti-CD28. Proliferation was measured by [3H]thymidine incorporation. Data represent the average cpm ± SD measured from triplicate culture wells. One representative experiment of three is shown. Using the CFSE dilution assay, it was ascertained that both CD4+ and CD8+ naive T cells underwent proliferation when stimulated with anti-CD81 and anti-CD28 (Fig. 3⇓A). The number of cell divisions accomplished during 5 days, as well as the magnitude of the population of cells undergoing mitosis, was very similar to what was observed for controls stimulated with anti-CD3 plus anti-CD28. Proliferation of cells stimulated with anti-CD81 plus anti-CD28 was accompanied by down-regulation of surface markers such as CD45RA and CD62L and up-regulation of CD45RO (Fig. 3⇓, B and C), suggesting that these cells were induced to differentiate into effector/memory cells (43). In addition, they also expressed CD40L (Fig. 3⇓D), a surface receptor through which T cells exert their helper function onto B cells (44). Expression of this marker peaked after 48 h for cells stimulated with anti-CD81 plus anti-CD28 and at 24 h for cells treated with anti-CD3 plus anti-CD28, subsequently decreasing to similar levels after 72 h. For easier description in this study, we will refer to the effector cells generated by simultaneous binding of CD81 and CD28 as TCO cells, as they arise upon engagement of costimulatory molecules only. Expansion and differentiation of human naive T cells following stimulation with anti-CD81 plus soluble anti-CD28. A, Purified CD45RO− T cells were labeled with CFSE and cultured with the indicated stimuli for 5 days. Cells were gated for expression of CD4 and CD8 and analyzed for cell division. One experiment representative of two is shown. B, Naive T cells were stimulated for 6 days as indicated. CD4+ and CD8+ cells were analyzed for surface levels of CD45RA and CD45RO. C, CD4+ and CD8+ cells were analyzed for expression of CD62L at day 0 (gray line histogram) and after 6 days of culture (black line histogram). Cells stained with isotype-matched controls (gray-filled histogram) were also shown. One representative experiment of four is shown. D, Purified human naive CD4+ T cells were cultured for 3 days in the presence of the indicated stimuli. Every 24 h cells were analyzed for expression of CD4 and CD40L. Cells stained with isotype-matched controls (gray-filled histogram) are shown. One experiment representative of four is shown. To evaluate the differentiation potential of naive T cells primed by binding of CD81 and CD28, we compared these with polyclonal type 2, type 1, and nonpolarized T cell lines. After expansion in IL-2, cells were restimulated with PMA and ionomycin and assayed for intracellular levels of effector cytokines (Fig. 4⇓). Production of IFN-γ could not be detected in CD4+ T cells primed with either HCV envelope proteins or anti-CD81 Abs plus anti-CD28. In contrast, these cells displayed levels of type 2 cytokines such as IL-4 and IL-13 (45), which closely resembled what was observed for cells primed under Th2 conditions (Fig. 4⇓A). Also CD8+ naive T cells stimulated with HCV-E2 or anti-CD81 plus anti-CD28 were able to produce IL-4, IL-13, and IFN-γ in comparable amounts to what was made by type 2 Tc cell (Tc2) controls (Fig. 4⇓B). These cells were also capable of making IL-5; however, in lower amounts than the in vitro generated Tc2 cells (our unpublished data). A similar effect was also observed on both CD4+ and CD8+ cells primed by ligation of CD82 and CD28. However, when effector cells were generated by co-engagement of CD3 plus CD81 and CD28, they extensively proliferated (our unpublished data), but did not differentiate into type 2 cells. Rather, they resembled nonpolarized cells. In line with these results, only CD4+ TCO and Th2 cells expressed chemoattractant receptor homologous molecule expressed on Th2 (CRTH2) (Fig. 4⇓C), a marker for terminally differentiated type 2 cells (46, 47). Differentiation potential of naive CD4+ and CD8+ T cells following co-engagement of CD81 and CD28. Purified naive CD4+ and CD8+ T cells were stimulated for 96 h as TCO cells under the indicated conditions. E2 plus anti-E2 (E2 + anti-E2) represents HCV envelope protein E2 immobilized on plate-bound anti-E2. Differentiation controls consisted of naive cells stimulated for 96 h with solid phase anti-CD3 plus soluble anti-CD28 in type 2 (Th2/Tc2), type 1 (Th1/Tc1), or nonpolarizing conditions. All of the cultures were expanded in IL-2, then cells were restimulated with PMA plus ionomycin for 2 h followed by an additional 4 h in the presence of brefeldin A for intracellular cytokine detection. A, CD4+ T cells stained for IL-4 and IFN-γ (top row) and for IL-13 and IFN-γ (bottom row). Values shown (top right) represent the percentage of cells present in each quadrant. One experiment representative of five with similar results is shown. B, CD8+ naive T cells stained for IL-4 plus IL-13 in the same fluorescence channel and IFN-γ. Cytokine production levels are shown for each quadrant. One experiment representative of three with similar results is shown. C, Expression of CRTH-2 by cells as in A after expansion in IL-2 (black line). Control cells stained with isotype matched control (gray filled histograms) are shown. One experiment representative of five is shown. To analyze more thoroughly the cytokine profile of CD4+ TCO effector cells, we compared these with in vitro-generated Th1 and Th2 cells using a system able to detect secretion of up to seven cytokines, after 24 h of TCR-mediated stimulation (Fig. 5⇓). 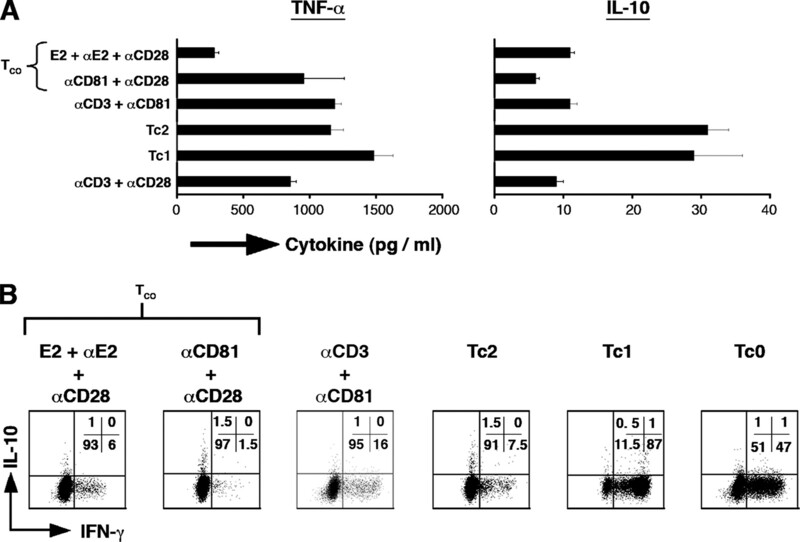 These experiments confirmed that CD4+ TCO cells do not produce IFN-γ, but rather Th2 cytokines such as IL-4, IL-13, IL-5, and the potent cross-regulator of type 1 immunity, IL-10 (48). In most cases the levels of IL-4, IL-13, IL-5, and IL-10 were comparable if not superior to those observed for Th2 effector cells. In addition, TCO cells appeared to be strong producers of the proinflammatory cytokine TNF-α (49) and the T cell growth factor IL-2 (50), distinguishing them from Th2 controls, where these two cytokines were detected in minimal amounts. To ascertain whether one of the two molecules predominantly contributed to the polarization of TCO cells, we included controls in which cells were primed in vitro by binding of the TCR and costimulated through either CD81 or CD28. In both cases, the effector cells obtained behaved like cells cultured in nonpolarizing conditions, suggesting that, as costimuli, these molecules were inadequate to push naive T cells to become Th2 cells. Thus, only by simultaneous binding of CD81 and CD28, in the absence of TCR stimulation, were we able to induce CD4+ naive T cells to differentiate into effector cells capable of producing large quantities of Th2 and proinflammatory cytokines. Cytokine profile of activated CD4+ TCO effector cells. A, Purified naive CD4+ T cells were stimulated for 96 h under specific conditions. TCO cells were stimulated by HCV-E2 immobilized on plate-bound anti-E2 plus soluble anti-CD28 (E2 + αE2 + αCD28) or on plate-bound anti-CD81 plus soluble anti-CD28 (αCD81 + αCD28). Differentiation controls were stimulated by plate-bound anti-CD3 plus soluble anti-CD28 in either type 2 (Th2) or type 1 (Th1) conditions. Additional controls were stimulated by solid phase anti-CD3 plus soluble anti-CD28 (αCD3 + αCD28) or plate-bound anti-CD81 (αCD3 + αCD81). All of the cultures were expanded in IL-2 and restimulated in duplicate with plate-bound anti-CD3 for 24 h. Culture supernatants were taken and assayed for the presence of multiple cytokines indicated (top) by electrochemiluminescence detection using a Meso-Scale 2400 Imager. Data represent the average concentration ± SD of the tested cytokine, expressed in picograms per milliliter less the background measured for cells stimulated with mouse IgG1 isotype control. One experiment representative of three is shown. The high amount of IL-10 secreted by CD4+ TCO cells is reminiscent of the effector phenotype of CD4+ regulatory T cells. Thus we decided to test whether TCO cells also expressed the regulatory T cell master control gene FoxP3 (51). We found that this transcription factor was similarly expressed by naive CD4+ T cells primed by either triggering of the TCR or by co-engagement of CD28 and CD81 (Fig. 6⇓A). In addition, when tested for the capacity to secrete other T cell inhibitory cytokines such as TGF-β (52), CD4+ TCO cells behaved as CD4+ effector cells generated by ligation of the TCR (53, 54). Therefore, we conclude that naive CD4 cells stimulated through CD81 and CD28 do not preferentially differentiate into regulatory T cells. 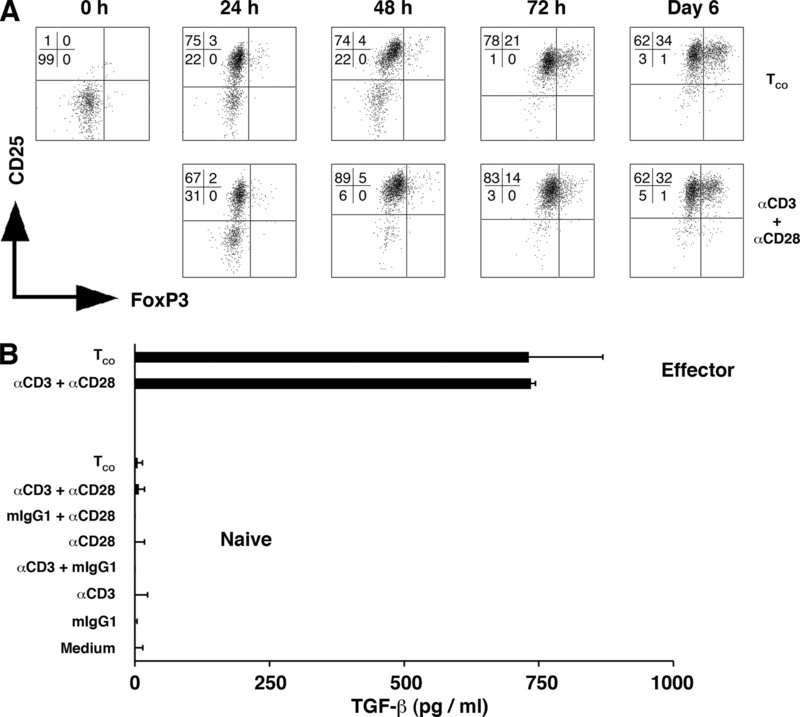 FoxP3 expression kinetics during TCO cell differentiation and TGF-β production capacity by CD4+ TCO effector cells. A, Purified naive CD4+ T cells were cultured in duplicates and stimulated as indicated. At the given time points, cells were stained for surface expression of CD25 and intracellular detection of FoxP3 by flow cytometry. Values shown (top left) represent the percentage of cells present in each quadrant. One experiment representative of three is shown. B, The same cells from A were stimulated with plate-bound anti-CD3 for 24 h either when freshly purified (bottom) or after 6 days of culture followed by expansion in IL-2 (top). Culture supernatants were collected and assayed for the presence of total TGF-β1 by ELISA. One experiment representative of three is shown. 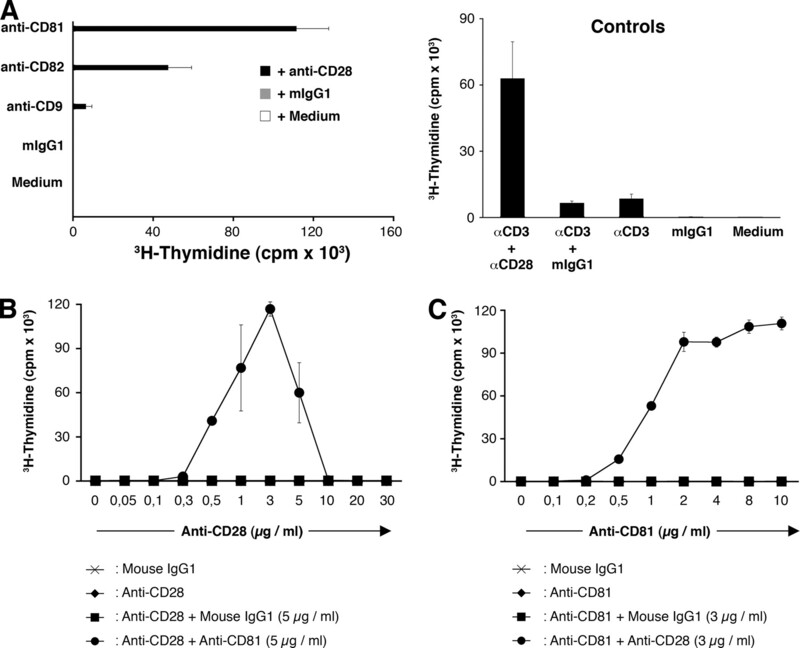 TCO cells represent plate-bound anti-CD81 (clone 81N) plus soluble anti-CD28 (clone ANC28.1/5D10); αCD3 plus αCD28 represents solid phase anti-CD3 (clone TR66) plus soluble anti-CD28; and mIgG1 represents mouse IgG1 isotype control. To further analyze CD8+ TCO cells we focused on whether they secreted large amounts of TNF-α or IL-10, thus exerting either an enhanced proinflammatory or T cell inhibitory activity. In contrast to CD4+ TCO cells, the quantity of IL-10 and TNF-α released in the culture medium by their CD8+ TCO counterparts and by conventionally activated CD8+ cells was similar (Fig. 7⇓A). A further difference between CD4+ and CD8+ TCO cells was that the latter included a minor subpopulation still capable of producing IFN-γ (Fig. 4⇑B). Thus we tested whether this subset also secreted IL-10. We found that some Tc1 and Tc0 cells were capable of producing both IFN-γ and IL-10, whereas IL-10 was made only by some TCO cells within the larger subpopulation of IFN-γ-negative cells (Fig. 7⇓B). Overall, these data indicate that the type 2 bias of CD8+ T cells is similar to that of CD4+ T cells, but that the overall cytokine profile is not identical. Proinflammatory and cross-regulatory potential of activated CD8+ TCO effector cells. A, Purified naive CD8+ T cells were primed with HCV-E2 or anti-CD81 plus anti-CD28 for 96 h under the same conditions as indicated in Fig. 5⇑. All of the cultures were expanded in IL-2 and restimulated in duplicate with plate-bound anti-CD3 for 24 h. Culture supernatants were taken and assayed by electrochemiluminescence for the presence of the cytokines TNF-α and IL-10 indicated (top) and detected using a Meso-Scale 2400 Imager. Data represent the average concentration ± SD of the tested cytokine, expressed in picograms per milliliter less background measured for cells stimulated with mouse IgG1 isotype control. One experiment representative of three is shown. B, The same cells from A were restimulated with PMA and ionomycin for 2 h followed by an additional 4 h in the presence of brefeldin A for intracellular detection of IFN-γ and IL-10. Values shown (top right) represent the percentage of cells present in each quadrant. One experiment representative of three is shown. The striking capabilities of TCO cells led us to investigate how they might arise. First we tested whether the stimuli underlying their activation triggered similar or divergent signaling pathways when compared with engagement of the CD3-TCR complex. We found that both types of stimulation were similarly susceptible to inhibitors of Src kinases, p38 and ERK (Fig. 8⇓). However, specific inhibition of the MAPK JNK completely blocked CD81 plus CD28-dependent activation of naive T cells but only partially the stimulation through the TCR. Intracellular signaling requirements for priming of TCO cells. Naive human T cells were purified from healthy adult donors and pretreated for 1 h at 37°C with inhibitors specific for Src kinases, p38, ERK, and JNK MAPKs at the indicated concentrations. Then cells were cultured in duplicate under stimulation with either plate-bound anti-CD3 plus soluble anti-CD28 (•) or plate-bound anti-CD81 plus soluble anti-CD28 (○) for 48 h at 37°C. Additional controls consisted of cells preincubated with medium only (M) or in the presence of DMSO (D) at the same concentration used at the highest dose of inhibitor. Cell proliferation was measured by [3H]thymidine incorporation and data points represent the mean inhibition observed. One experiment representative of five with similar results is shown. Because JNK is thought to be important for activation of effector and not naive precursors (55), we decided to ascertain whether TCO cells followed a sequential development pathway involving a Th0 precursor capable of producing both IFN-γ and IL-4 (38, 56, 57) or differentiated directly into type 2 effector cells. During a time course experiment ranging from 6 to 72 h postactivation, we found that freshly isolated naive CD4+ T cells primed in vitro by coligation of CD81 and CD28 secreted IL-4 much earlier than IFN-γ, whereas the onset of production of both cytokines coincided for cells stimulated through the TCR. 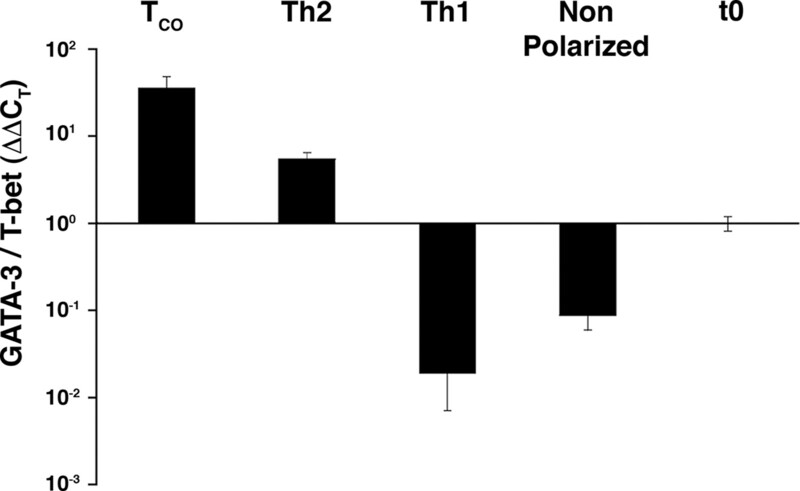 In addition, IFN-γ production by TCO cells was almost 30 times lower than by nonpolarized controls, whereas IL-4 was consistently detected in superior amounts, suggesting a direct Th2-like polarization. This primacy was observed also for other type 2 cytokines such as IL-5 and IL-13, and for TNF-α and IL-2. Only IL-10 was higher in the supernatants taken from cells stimulated on the TCR (Fig. 9⇓A). These differences were not due to different degrees of activation because TCO and nonpolarized controls expressed equivalent levels of the activation markers CD69 and CD25 at all time points (our unpublished data). Early cytokine production and STAT6 phosphorylation in naive T cells under TCO priming. A, Purified naive CD4+ T cells were cultured in duplicate and stimulated as indicated by each symbol and described in Fig. 1⇑A. At the given time points, culture supernatants were collected and assayed for the presence of multiple cytokines by electrochemiluminescence using a Meso-Scale 2400 imager. Data points represent the average concentration ± SD of the tested cytokine (in picograms per milliliter). One experiment representative of three is shown. B, At the indicated time points, the same cells from A were stained for intracellular detection of phosphorylated STAT6 by flow cytometry. Levels of phospho-STAT6 (thick line histogram) in cells cultured either under TCO stimulation (top) or with anti-CD3 plus soluble anti-CD28 (bottom). Cells stimulated in the same conditions but in the presence of neutralizing anti-IL-4 (thin line histogram) are indicated. Cells treated with the same stimuli plus 400 U/ml exogenous IL-4 (gray line histogram) and Alexa Fluor 488-conjugated isotype controls (gray-filled histogram) are also shown. One experiment representative of three, relative to the same cells in A, is shown. TCO represents plate-bound anti-CD81 (clone 81N) plus soluble anti-CD28 (clone ANC28.1/5D10) and αCD3 plus αCD28 represents solid phase anti-CD3 (clone TR66) plus soluble anti-CD28. Stimulated cells were also assayed by flow cytometry for intracellular levels of the phosphorylated or active form of STAT6 (Fig. 9⇑B). This transcription factor becomes activated upon binding of IL-4 to its own receptor and is considered to be essential for expression of the Th2 master control gene GATA-3 and for sustained production of type 2 cytokines (38). Activated STAT6 could be detected in TCO-primed cells as early as 24 h and its levels increased with time. Phosphorylation of this protein could be inhibited by neutralizing Abs against IL-4, and no difference in the levels of active STAT6 was observed between TCO cells primed either in the presence or absence of exogenous IL-4. Accordingly, as its expression is thought to be dependent on STAT6 signaling, GATA-3 mRNA was found to be up-regulated in TCO cells after 3 days of culture, whereas expression of the Th1 promoting gene T-bet was reduced (Fig. 10⇓). Modulation of master transcription factors in CD4+ TCO cells. Purified naive CD4+ T cells were harvested at t = 0 (t0) or after 72 h of culture under TCO, Th2, Th1, and nonpolarizing conditions. RNA was extracted and analyzed for expression of T-bet, GATA-3, and GAPDH using real-time fluorogenic PCR. Each reaction was performed in triplicate. For each stimulus, GATA-3 and T-bet transcripts were normalized to GAPDH. The ratio between the normalized level of GATA-3 over T-bet was calculated. The ratio was normalized by dividing it with the ratio GATA-3 over T-bet for nonstimulated cells. Results represent the average ± SD of GATA-3 over T-bet ratio. One experiment representative of three with similar results is shown. Our results presented in this study show a new TCR-independent pathway of activation for human naive T cells based on simultaneous engagement of the two costimulatory molecules CD81 and CD28. Whereas other forms of TCR-independent activation of naive T cells have been observed before (58, 59, 60, 61, 62), CD81 and CD28 were never described as functional partners. In other systems, binding of CD81 is sufficient to induce proliferation of γδ T cells (28) and naive B lymphocytes in vitro (29). However, our previous (30) and present data indicate that in the case of αβ T cells, the sole engagement of CD81 does not exert similar effects. Binding of CD81 either with mAbs or recombinant HCV envelope proteins, or of CD82 with mAbs, synergized with concomitant engagement of CD28 and not with other markers such as CD2, LFA-1, and CD49d. As tetraspanins are involved in lateral interactions among themselves and other nontetraspanin proteins (6), it is possible that CD82 and CD9 participate in the signaling complex that we induced by the engagement of CD81 and vice versa. In line with previous studies showing similar costimulatory ability for these three tetraspanins (63, 64), we show that binding of either of these three molecules on T cells leads to a similar biological response (30, 36, 37). However, the magnitude of the response elicited by engagement of CD9 was far inferior to what was observed for engagement of CD82 or CD81. Our further characterization showed that both CD4+ and CD8+ naive cells proliferated in response to co-engagement of CD81 and CD28, and they did so as robustly as cells stimulated through the TCR. Eventually these cells differentiated into effector or memory T cells that produced predominantly type 2 cytokines such as IL-4, IL-13, IL-5 (65), and the potent cross-regulator of type 1 immunity IL-10 (48, 66), whereas the levels of IFN-γ detected from CD4+ and CD8+ TCO cells were low and comparable with levels observed for type 2 cells generated in vitro by strongly polarizing conditions (46). Furthermore, CD4+ TCO effector cells expressed CRTH2 (47), a marker characteristic for terminally differentiated type 2 cells that retain their differentiated state even if cultured under type 1 conditions in vitro (46). Given the high amounts of IL-10 secreted by CD4+ TCO cells, we tested whether this response was associated with increased levels of expression of the regulatory T cell master control gene FoxP3 (51), and whether other T cell inhibitory cytokines such as TGF-β were also produced (52). In either case we could not observe any preferential induction by the coligation of CD28 and CD81, indicating that this stimulation does not exert a bias toward regulatory T cell development. Also CD8+ TCO cells secrete IL-10. However, this production was always inferior to that observed for Tc1 and Tc2 controls. Overall, our data supports the hypothesis that the production of IL-10 by CD4+ TCO cells is a consequence of their strong type 2 polarization (48), whereas in the case of CD8+ TCO cells, this property seems to be broadly shared among different types of CD8+ effector T cells. The striking differentiation of both CD4+ and CD8+ TCO cells into type 2 effectors is based on the synergistic involvement of two molecules, CD81 and CD28, both described in several studies as endowed with type 2 immunity-promoting activity (11, 67, 68). Our observation that the new process of activation described in this study was dependent on active Src kinases hints at a molecular mechanism for the proximal signaling events involved in the process. Because binding of the TCR, CD81, or CD28 can induce activation of the membrane proximal Src kinase p56lck in T cells (31, 69), co-engagement of CD81 and CD28 might result in the recruitment of substrate-harboring lipid rafts (70) or tetraspanin-enriched microdomains (6) around foci of active lck, triggering sufficient amounts of signals that would finally lead to cell division. When we further characterized the process of generating TCO cells, we found at priming that the onset of IL-4 secretion preceded the onset of IFN-γ secretion, which remained very low throughout the experiment. This caused strong early IL-4-dependent signaling through STAT6, eventually leading to up-regulation of the Th2 master control gene and regulator of IL-10 transcription GATA-3 and down-regulation of the Th1 counterpart T-bet (38, 71, 72). These data suggest that TCO cells might differentiate directly into Th2-like cells skipping an initial “Th0” stage, characterized by dual secretion of IL-4 and IFN-γ (46, 56, 57). The hypothesis of an “accelerated” program of differentiation in TCO cells is consistent with the observation that inhibition of the MAPK JNK completely blocks CD81 plus CD28-dependent activation of naive T cells but only partially the stimulation through the TCR. In fact, JNK can be activated by sole binding of CD81 in B cells (29) and is thought to be required for the activation of effector and not naive T cells (55). Apart from proposed homotypic interactions, there are no known physiologic ligands for CD81 and CD82 (6). Thus, it is difficult to envisage that an activation process as described in this study occurs in healthy individuals in vivo. However, because the HCV envelope protein E2 is a ligand for CD81 (13), we propose that the CD81-CD28 synergistic engagement may be productive during HCV infection. Accordingly, we show that only those regions of CD81 recognized by the virus can mediate T cell priming when co-engaged with CD28. The natural ligands for the latter, namely CD80 and CD86, are largely expressed in secondary lymphoid organs (73) and under certain conditions in the liver (35, 36, 37). However, whereas HCV proteins like the core Ag can be easily detected in the bloodstream (74), this is not the case for E2, which has been detected only at liver biopsy (75, 76). Thus, it seems that the ligands required for activation to occur, namely CD80, CD86, and HCV-E2, are present in sufficient amounts only in the liver and, possibly, its draining secondary lymphoid organs. Interestingly, lymphadenopathy of perihepatic lymph nodes is commonly detected in HCV-infected individuals (32, 77, 78). This symptom is considered to be highly predictive of HCV infection when detected by chance (77, 78), and its magnitude directly correlates with the level of viremia, increased frequency of peripheral CD4+ and CD8+ T cells, and progression of liver fibrosis (32), a condition promoted by type 2 cytokines (79, 80, 81). We suggest that TCO cells may participate in the enlargement of liver-associated lymph nodes, from which they would affect the quality of the HCV-specific immune response. Alternatively, TCO cells could be generated directly in the infected liver, when recirculating naive T cells interact with activated CD80+ Kupffer cells in the narrow and slow flowing hepatic sinusoidal vasculature. Accordingly, formation of clusters of activated Kupffer cells and T cells have been observed in the blood vessels, the transendothelial interphase, and within the parenchyma of liver specimens from HCV-infected individuals (36). In these patients, CD80 expression was also found on the surface of hepatocytes (35, 37). Because also these cells have been shown to contact extensively with circulating lymphocytes through the underlying fenestrated liver sinusoidal endothelial cells (82), it is thus conceivable that upon HCV infection, TCO-like activation of naive T cells could occur intrahepatically. We propose that TCO cells generated in vivo would oppose the generation of a strong type 1-specific response, which has been shown to prevent the establishment of chronic HCV infection and lead to virus elimination (18, 19, 20, 83). In fact, nonresolving patients display phases of HCV-specific type 2 responses coinciding with low to undetectable intrahepatic T cell-mediated cytotoxicity (22, 23). Even during strong cytolytic responses, HCV-specific type 1 T cells in the periphery have intrahepatic counterparts that produce type 2 cytokines (22). Similarly, bulk-stimulated intrahepatic CD4+ and CD8+ T cells from chronic patients produce less IFN-γ than peripheral blood cells and, in the case of CD8+ cells, lower levels of perforin (21), resembling Tc2 lymphocytes (84, 85). These data hint at the presence of an elusive type 2 biasing factor in the HCV-infected liver or associated lymphoid tissues, and we suggest that this might include nonspecific effector TCO cells capable of exerting type 2 pressure on HCV-specific cells. During priming in vitro, TCR engagement prevents type 2 polarization of T cells costimulated on CD81 and CD28. It is therefore conceivable that, in infected individuals, Ag-specific cells cannot be directly skewed away from type 1 immunity, but rather undergo modulation by the cytokines secreted by TCO cells in the surrounding microenvironment (46, 86, 87). TCO cells might also participate in the ongoing inflammation that characterizes the HCV-infected liver. In fact, CD4+ TCO cells are distinct from canonical Th2 cells as they secrete the proinflammatory mediator TNF-α and, in line with their strong proliferation potential, large amounts of IL-2. As for CD8+ cells, CD81 and CD28 stimulation does not preferentially induce TNF-α in comparison to conventional activation, as was observed in CD4+ T cells. However, CD8+ T cells are overall strong producers of TNF-α and therefore have a high proinflammatory potential. Interestingly, CD28+CD8+ effector T cells have been detected in the liver, and their relative frequency directly correlates with higher scores of inflammation (21), a condition favored by local secretion of TNF-α (49, 88, 89). In addition, recent works also correlate strong expression of E2 on the membrane of hepatocytes with higher inflammation of the liver (75). Overall, this study demonstrates that naive human T cells can be primed to become type 2-like proinflammatory effector cells via a novel pathway mediated by co-engagement of two costimulatory molecules, the first being CD28 and the second a member of the tetraspanin family of proteins such as CD81, CD82, or CD9. The liver and draining lymph nodes of HCV-infected humans are enriched in ligands for both CD28 and CD81 and therefore represent an environment in which this phenomenon is likely to occur. Our data delineates a putative mechanism of immune escape by which the HCV counteracts specific type 1 responses associated with viral clearance. We thank Flora Castellino, Grazia Galli, Andrew Edwards, Angela Nobbs, Kate Seib, and Robert Janulczyk for critical reading of the manuscript. All authors are or were employees of Novartis Vaccines, which funded this study. ↵1 This work was supported by funding from Novartis Vaccines. ↵2 Current address: Cell Biology Group, Deutsches Rheumaforschungszentrum (DRFZ) Berlin, Charitéplatz 1, Berlin, Germany. ↵4 Abbreviations used in this paper: HCV, hepatitis C virus; CD62L, L-selectin; TCO, T cells stimulated by CD28 and CD81 coengagement. van der Merwe, P. A., S. J. Davis. 2003. Molecular interactions mediating T cell antigen recognition. Annu. Rev. Immunol. 21: 659-684. Udagawa, T., D. G. Woodside, B. W. McIntyre. 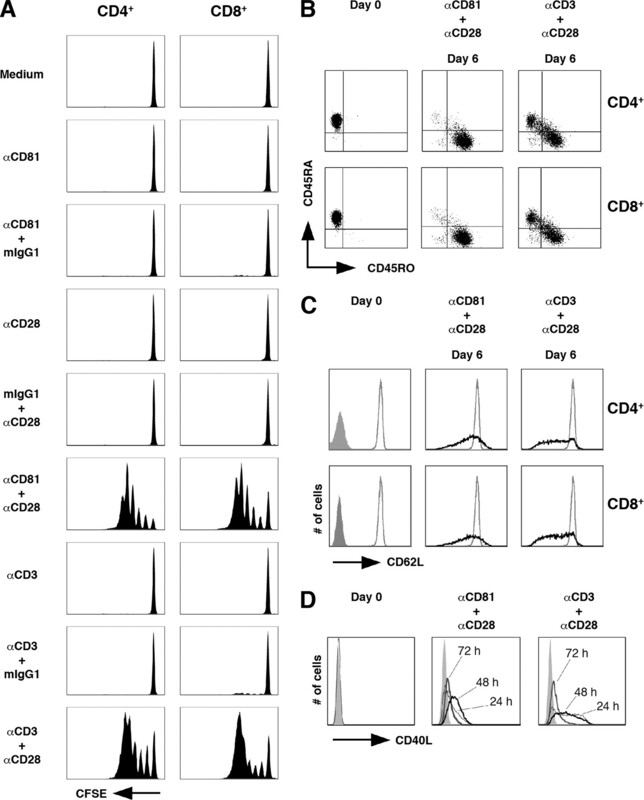 1996. α4β1 (CD49d/CD29) integrin costimulation of human T cells enhances transcription factor and cytokine induction in the absence of altered sensitivity to anti-CD3 stimulation. J. Immunol. 157: 1965-1972. Wakkach, A., F. Cottrez, H. Groux. 2001. 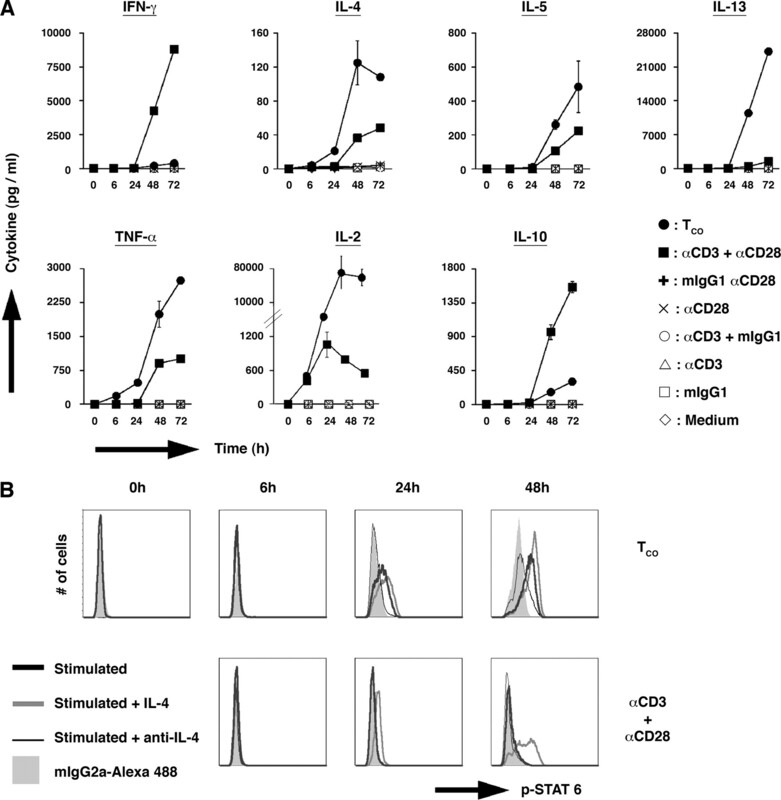 Differentiation of regulatory T cells 1 is induced by CD2 costimulation. J. Immunol. 167: 3107-3113. Van Seventer, G. A., Y. Shimizu, K. J. Horgan, S. Shaw. 1990. The LFA-1 ligand ICAM-1 provides an important costimulatory signal for T cell receptor-mediated activation of resting T cells. J. Immunol. 144: 4579-4586. Levy, S., T. Shoham. 2005. The tetraspanin web modulates immune-signalling complexes. Nat. Rev. Immunol. 5: 136-148. Cherukuri, A., R. H. Carter, S. Brooks, W. Bornmann, R. Finn, C. S. Dowd, S. K. Pierce. 2004. B cell signaling is regulated by induced palmitoylation of CD81. J. Biol. Chem. 279: 31973-31982. Mittelbrunn, M., M. Yanez, D. Sancho, A. Ursa, F. Sanchez-Madrid. 2002. Cutting edge: dynamic redistribution of tetraspanin CD81 at the central zone of the immune synapse in both T lymphocytes and APC. J. Immunol. 169: 6691-6695. Cherukuri, A., T. Shoham, H. W. Sohn, S. Levy, S. Brooks, R. Carter, S. K. Pierce. 2004. The tetraspanin CD81 is necessary for partitioning of coligated CD19/CD21-B cell antigen receptor complexes into signaling-active lipid rafts. J. Immunol. 172: 370-380. Deng, J., R. H. Dekruyff, G. J. Freeman, D. T. Umetsu, S. Levy. 2002. 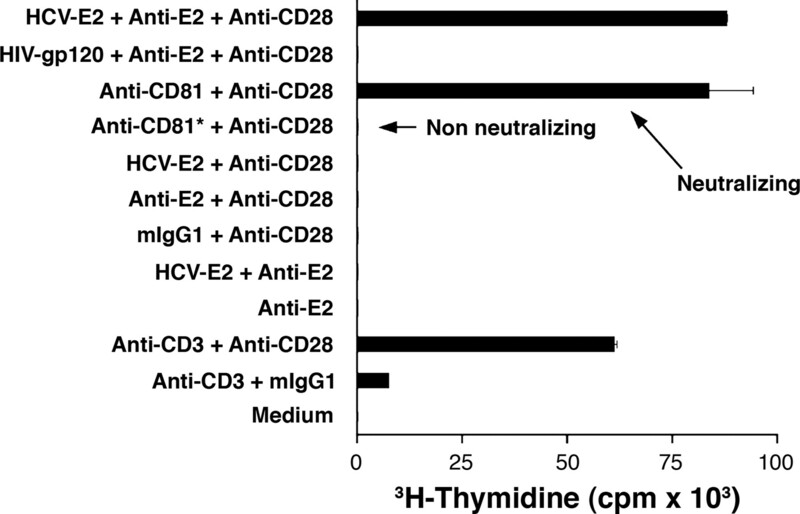 Critical role of CD81 in cognate T-B cell interactions leading to Th2 responses. Int. Immunol. 14: 513-523. Maecker, H. T., M. S. Do, S. Levy. 1998. CD81 on B cells promotes interleukin 4 secretion and antibody production during T helper type 2 immune responses. Proc. Natl. Acad. Sci. USA 95: 2458-2462. Pileri, P., Y. Uematsu, S. Campagnoli, G. Galli, F. Falugi, R. Petracca, A. J. Weiner, M. Houghton, D. Rosa, G. Grandi, S. Abrignani. 1998. Binding of hepatitis C virus to CD81. Science 282: 938-941. Houghton, M., S. Abrignani. 2005. Prospects for a vaccine against the hepatitis C virus. Nature 436: 961-966. Feld, J. J., J. H. Hoofnagle. 2005. Mechanism of action of interferon and ribavirin in treatment of hepatitis C. Nature 436: 967-972. Dustin, L. B., C. M. Rice. 2006. Flying under the radar: the immunobiology of hepatitis C. Annu. Rev. Immunol. 25: 71-99. Bowen, D. G., C. M. Walker. 2005. Adaptive immune responses in acute and chronic hepatitis C virus infection. Nature 436: 946-952. Thimme, R., D. Oldach, K. M. Chang, C. Steiger, S. C. Ray, F. V. Chisari. 2001. Determinants of viral clearance and persistence during acute hepatitis C virus infection. J. Exp. Med. 194: 1395-1406. Wang, J., T. H. Holmes, L. L. de Guevara, R. Cheung, T. L. Wright, X. S. He, H. B. Greenberg. 2006. Phenotypic and functional status of intrahepatic T cells in chronic hepatitis C. J. Infect. Dis. 194: 1068-1077. Prezzi, C., M. A. Casciaro, V. Francavilla, E. Schiaffella, L. Finocchi, L. V. Chircu, G. Bruno, A. Sette, S. Abrignani, V. Barnaba. 2001. Virus-specific CD8+ T cells with type 1 or type 2 cytokine profile are related to different disease activity in chronic hepatitis C virus infection. Eur. J. Immunol. 31: 894-906. Tsai, S. L., Y. F. Liaw, M. H. Chen, C. Y. Huang, G. C. Kuo. 1997. Detection of type 2-like T-helper cells in hepatitis C virus infection: implications for hepatitis C virus chronicity. Hepatology 25: 449-458. Dumoulin, F. L., A. Bach, L. Leifeld, M. El-Bakri, H. P. Fischer, T. Sauerbruch, U. Spengler. 1997. Semiquantitative analysis of intrahepatic cytokine mRNAs in chronic hepatitis C. J. Infect. Dis. 175: 681-685. Fan, X. G., W. E. Liu, C. Z. Li, Z. C. Wang, L. X. Luo, D. M. Tan, G. L. Hu, Z. Zhang. 1998. Circulating Th1 and Th2 cytokines in patients with hepatitis C virus infection. Mediators Inflamm. 7: 295-297. Crotta, S., A. Stilla, A. Wack, A. D'Andrea, S. Nuti, U. D'Oro, M. Mosca, F. Filliponi, R. M. Brunetto, F. Bonino, et al 2002. Inhibition of natural killer cells through engagement of CD81 by the major hepatitis C virus envelope protein. J. Exp. Med. 195: 35-41. Tseng, C. T., E. Miskovsky, G. R. Klimpel. 2001. Crosslinking CD81 results in activation of TCRγδ T cells. Cell Immunol. 207: 19-27. Rosa, D., G. Saletti, E. De Gregorio, F. Zorat, C. Comar, U. D'Oro, S. Nuti, M. Houghton, V. Barnaba, G. Pozzato, S. Abrignani. 2005. Activation of naive B lymphocytes via CD81, a pathogenetic mechanism for hepatitis C virus-associated B lymphocyte disorders. Proc. Natl. Acad. Sci. USA 102: 18544-18549. Wack, A., E. Soldaini, C. Tseng, S. Nuti, G. Klimpel, S. Abrignani. 2001. Binding of the hepatitis C virus envelope protein E2 to CD81 provides a co-stimulatory signal for human T cells. Eur. J. Immunol. 31: 166-175. Soldaini, E., A. Wack, U. D'Oro, S. Nuti, C. Ulivieri, C. T. Baldari, S. Abrignani. 2003. T cell costimulation by the hepatitis C virus envelope protein E2 binding to CD81 is mediated by Lck. Eur. J. Immunol. 33: 455-464. Muller, P., C. Renou, A. Harafa, E. Jouve, G. Kaplanski, E. Ville, J. J. Bertrand, C. Masson, T. Benderitter, P. Halfon. 2003. Lymph node enlargement within the hepatoduodenal ligament in patients with chronic hepatitis C reflects the immunological cellular response of the host. J. Hepatol. 39: 807-813. Nuti, S., D. Rosa, N. M. Valiante, G. Saletti, M. Caratozzolo, P. Dellabona, V. Barnaba, S. Abrignani. 1998. Dynamics of intra-hepatic lymphocytes in chronic hepatitis C: enrichment for Vα24+ T cells and rapid elimination of effector cells by apoptosis. Eur. J. Immunol. 28: 3448-3455. Abrignani, S.. 1997. Bystander activation by cytokines of intrahepatic T cells in chronic viral hepatitis. Semin. Liver Dis. 17: 319-322. Fiore, G., G. Piazzolla, V. Galetta, L. Caccetta, O. Schiraldi, S. Antonaci. 1999. Liver tissue expression of CD80 and CD95 antigens in chronic hepatitis C: relationship with biological and histological disease activities. Microbios. 97: 29-38. Burgio, V. L., G. Ballardini, M. Artini, M. Caratozzolo, F. B. Bianchi, M. Levrero. 1998. Expression of co-stimulatory molecules by Kupffer cells in chronic hepatitis of hepatitis C virus etiology. Hepatology 27: 1600-1606. Mochizuki, K., N. Hayashi, K. Katayama, N. Hiramatsu, T. Kanto, E. Mita, T. Tatsumi, N. Kuzushita, A. Kasahara, H. Fusamoto, et al 1997. B7/BB-1 expression and hepatitis activity in liver tissues of patients with chronic hepatitis C. Hepatology 25: 713-718. Heile, J. M., Y. L. Fong, D. Rosa, K. Berger, G. Saletti, S. Campagnoli, G. Bensi, S. Capo, S. Coates, K. Crawford, et al 2000. Evaluation of hepatitis C virus glycoprotein E2 for vaccine design: an endoplasmic reticulum-retained recombinant protein is superior to secreted recombinant protein and DNA-based vaccine candidates. J. Virol. 74: 6885-6892. Krutzik, P. O., J. M. Irish, G. P. Nolan, O. D. Perez. 2004. Analysis of protein phosphorylation and cellular signaling events by flow cytometry: techniques and clinical applications. Clin. Immunol. 110: 206-221. Krutzik, P. O., G. P. Nolan. 2003. Intracellular phospho-protein staining techniques for flow cytometry: monitoring single cell signaling events. Cytometry A 55: 61-70. Durie, F. H., T. M. Foy, S. R. Masters, J. D. Laman, R. J. Noelle. 1994. The role of CD40 in the regulation of humoral and cell-mediated immunity. Immunol. Today 15: 406-411. Romagnani, S.. 2000. T-cell subsets (Th1 versus Th2). Ann. Allergy Asthma Immunol. 85: 9-18. Messi, M., I. Giacchetto, K. Nagata, A. Lanzavecchia, G. Natoli, F. Sallusto. 2003. Memory and flexibility of cytokine gene expression as separable properties of human TH1 and TH2 lymphocytes. Nat. Immunol. 4: 78-86. Cosmi, L., F. Annunziato, M. I. G. Galli, R. M. E. Maggi, K. Nagata, S. Romagnani. 2000. CRTH2 is the most reliable marker for the detection of circulating human type 2 Th and type 2 T cytotoxic cells in health and disease. Eur. J. Immunol. 30: 2972-2979. Mosmann, T. R., K. W. Moore. 1991. 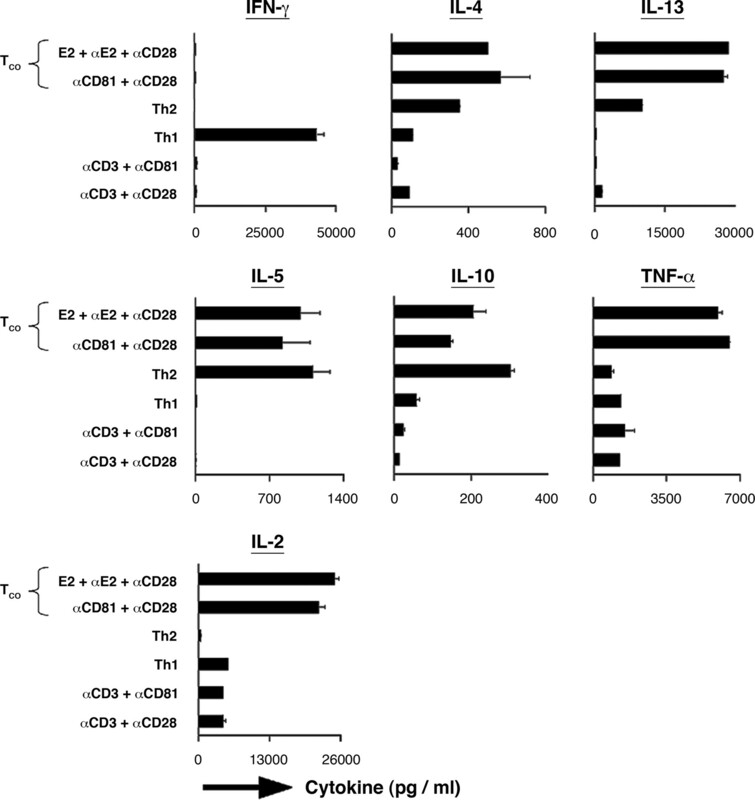 The role of IL-10 in crossregulation of TH1 and TH2 responses. Immunol. Today 12: A49-A53. Moller, B., P. M. Villiger. 2006. Inhibition of IL-1, IL-6, and TNF-α in immune-mediated inflammatory diseases. Springer Semin. Immunopathol. 27: 391-408. Fehervari, Z., T. Yamaguchi, S. Sakaguchi. 2006. The dichotomous role of IL-2: tolerance versus immunity. Trends Immunol. 27: 109-111. Tran, D. Q., H. Ramsey, E. M. Shevach. 2007. Induction of FoxP3 expression in naive human CD4+FoxP3 T cells by T-cell receptor stimulation is transforming growth factor-β dependent but does not confer a regulatory phenotype. Blood 110: 2983-2990. Dong, C., D. D. Yang, C. Tournier, A. J. Whitmarsh, J. Xu, R. J. Davis, R. A. Flavell. 2000. JNK is required for effector T-cell function but not for T-cell activation. Nature 405: 91-94. Nakamura, T., Y. Kamogawa, K. Bottomly, R. A. Flavell. 1997. Polarization of IL-4- and IFN-γ-producing CD4+ T cells following activation of naive CD4+ T cells. J. Immunol. 158: 1085-1094. Kamogawa, Y., L. A. Minasi, S. R. Carding, K. Bottomly, R. A. Flavell. 1993. The relationship of IL-4- and IFN γ-producing T cells studied by lineage ablation of IL-4-producing cells. Cell 75: 985-995. Unutmaz, D., P. Pileri, S. Abrignani. 1994. Antigen-independent activation of naive and memory resting T cells by a cytokine combination. J. Exp. Med. 180: 1159-1164. Geginat, J., F. Sallusto, A. Lanzavecchia. 2001. Cytokine-driven proliferation and differentiation of human naive, central memory, and effector memory CD4+ T cells. J. Exp. Med. 194: 1711-1719. Meuer, S. C., R. E. Hussey, M. Fabbi, D. Fox, O. Acuto, K. A. Fitzgerald, J. C. Hodgdon, J. P. Protentis, S. F. Schlossman, E. L. Reinherz. 1984. An alternative pathway of T-cell activation: a functional role for the 50 kd T11 sheep erythrocyte receptor protein. Cell 36: 897-906. Tacke, M., G. Hanke, T. Hanke, T. Hünig. 1997. CD28-mediated induction of proliferation in resting T cells in vitro and in vivo without engagement of the T cell receptor: evidence for functionally distinct forms of CD28. Eur. J. Immunol. 27: 239-247. Kerstan, A., T. Hünig. 2004. Cutting edge: distinct TCR- and CD28-derived signals regulate CD95L, Bcl-xL, and the survival of primary T cells. J. Immunol. 172: 1341-1345. Lagaudriere-Gesbert, C., F. Le Naour, S. Lebel-Binay, M. Billard, E. Lemichez, P. Boquet, C. Boucheix, H. Conjeaud, E. Rubinstein. 1997. Functional analysis of four tetraspans, CD9, CD53, CD81, and CD82, suggests a common role in costimulation, cell adhesion, and migration: only CD9 upregulates HB-EGF activity. Cell Immunol. 182: 105-112. Delaguillaumie, A., J. Harriague, S. Kohanna, G. Bismuth, E. Rubinstein, M. Seigneuret, H. Conjeaud. 2004. Tetraspanin CD82 controls the association of cholesterol-dependent microdomains with the actin cytoskeleton in T lymphocytes: relevance to co-stimulation. J. Cell Sci. 117: 5269-5282. Romagnani, S.. 1997. The Th1/Th2 paradigm. Immunol. Today 18: 263-266. Baugh, J. A., R. Bucala. 2001. Mechanisms for modulating TNF α in immune and inflammatory disease. Curr. Opin. Drug Discov. Devel. 4: 635-650. Kubo, M., M. Yamashita, R. Abe, T. Tada, K. Okumura, J. T. Ransom, T. Nakayama. 1999. CD28 costimulation accelerates IL-4 receptor sensitivity and IL-4-mediated Th2 differentiation. J. Immunol. 163: 2432-2442. Andres, P. G., K. C. Howland, A. Nirula, L. P. Kane, L. Barron, D. Dresnek, A. Sadra, J. Imboden, A. Weiss, A. K. Abbas. 2004. Distinct regions in the CD28 cytoplasmic domain are required for T helper type 2 differentiation. Nat. Immunol. 5: 435-442. August, A., B. Dupont. 1994. Activation of src family kinase lck following CD28 crosslinking in the Jurkat leukemic cell line. Biochem. Biophys. Res. Commun. 199: 1466-1473. Shoemaker, J., M. Saraiva, A. O'Garra. 2006. GATA-3 directly remodels the IL-10 locus independently of IL-4 in CD4+ T cells. J. Immunol. 176: 3470-3479. Chang, H. D., C. Helbig, L. Tykocinski, S. Kreher, J. Koeck, U. Niesner, A. Radbruch. 2007. Expression of IL-10 in Th memory lymphocytes is conditional on IL-12 or IL-4, unless the IL-10 gene is imprinted by GATA-3. Eur. J. Immunol. 37: 807-817. Sharpe, A. H., G. J. Freeman. 2002. The B7-CD28 superfamily. Nat. Rev. Immunol. 2: 116-126. Laperche, S., N. Le Marrec, A. Girault, F. Bouchardeau, A. Servant-Delmas, M. Maniez-Montreuil, P. Gallian, T. Levayer, P. Morel, N. Simon. 2005. Simultaneous detection of hepatitis C virus (HCV) core antigen and anti-HCV antibodies improves the early detection of HCV infection. J. Clin. Microbiol. 43: 3877-3883. Galy, O., M. A. Petit, S. Benjelloun, P. Chevallier, M. Chevallier, P. Srivatanakul, A. Karalak, C. Carreira, N. Lyandrat, A. Essaid, et al 2007. Efficient hepatitis C antigen immunohistological staining in sections of normal, cirrhotic and tumoral liver using a new monoclonal antibody directed against serum-derived HCV E2 glycoproteins. Cancer Lett. 248: 81-88. Nakamoto, Y., S. Kaneko, M. Honda, M. Unoura, J. Cheong, A. Harada, K. Matsushima, K. Kobayashi, S. Murakami. 1994. Detection of the putative E2 protein of hepatitis C virus in human liver. J. Med. Virol. 42: 374-379. Neri, S., D. Ierna, B. Mauceri, G. Abate, D. Cilio, F. Bordonaro, S. Calvagno, D. Balsamo, D. Pulvirenti, O. Magliocco, et al 2003. Can ultrasonographic findings of perihepatic lymphadenopathy promote investigations to detect possible presence of virus C infection in non-symptomatic subjects?. Hepatol. Res. 27: 124-128. Ierna, D., R. A. D'Amico, S. Antoci, E. Campanile, S. Neri. 2000. Perihepatic lymphadenopathy in chronic hepatitis C: a complementary diagnostic element?. J. Gastroenterol. Hepatol. 15: 783-785. Wynn, T. A.. 2003. IL-13 effector functions. Annu. Rev. Immunol. 21: 425-456. Kodera, T., T. L. McGaha, R. Phelps, W. E. Paul, C. A. Bona. 2002. Disrupting the IL-4 gene rescues mice homozygous for the tight-skin mutation from embryonic death and diminishes TGF-β production by fibroblasts. Proc. Natl. Acad. Sci. USA 99: 3800-3805.
de Lalla, C., G. Galli, L. Aldrighetti, R. Romeo, M. Mariani, A. Monno, S. Nuti, M. Colombo, F. Callea, S. A. Porcelli, et al 2004. Production of profibrotic cytokines by invariant NKT cells characterizes cirrhosis progression in chronic viral hepatitis. J. Immunol. 173: 1417-1425. Warren, A., D. G. Le Couteur, R. Fraser, D. G. Bowen, G. W. McCaughan, P. Bertolino. 2006. T lymphocytes interact with hepatocytes through fenestrations in murine liver sinusoidal endothelial cells. Hepatology 44: 1182-1190. Lechner, F., D. K. Wong, P. R. Dunbar, R. Chapman, R. T. Chung, P. Dohrenwend, G. Robbins, R. Phillips, P. Klenerman, B. D. Walker. 2000. Analysis of successful immune responses in persons infected with hepatitis C virus. J. Exp. Med. 191: 1499-1512. Kienzle, N., K. Buttigieg, P. Groves, T. Kawula, A. Kelso. 2002. A clonal culture system demonstrates that IL-4 induces a subpopulation of noncytolytic T cells with low CD8, perforin, and granzyme expression. J. Immunol. 168: 1672-1681. Heath, V. L., L. Showe, C. Crain, F. J. Barrat, G. Trinchieri, A. O'Garra. 2000. Cutting edge: ectopic expression of the IL-12 receptor-β2 in developing and committed Th2 cells does not affect the production of IL-4 or induce the production of IFN-γ. J. Immunol. 164: 2861-2865. Nishikomori, R., R. O. Ehrhardt, W. Strober. 2000. T helper type 2 cell differentiation occurs in the presence of interleukin 12 receptor β2 chain expression and signaling. J. Exp. Med. 191: 847-858. Larrea, E., N. Garcia, C. Qian, M. P. Civeira, J. Prieto. 1996. Tumor necrosis factor α gene expression and the response to interferon in chronic hepatitis C. Hepatology 23: 210-217. Torre, F., S. Rossol, N. Pelli, M. Basso, A. Delfino, A. Picciotto. 2004. Kinetics of soluble tumour necrosis factor (TNF)-α receptors and cytokines in the early phase of treatment for chronic hepatitis C: comparison between interferon (IFN)-α alone, IFN-α plus amantadine or plus ribavirin. Clin. Exp. Immunol. 136: 507-512.